Huge Savings Item! 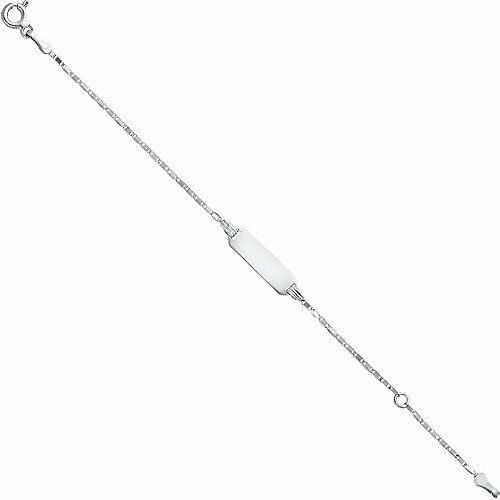 Save 12% on the CUSTOM ENGRAVED - 14K White Solid Gold Valentino Tiny Baby ID Bracelet - 4.5+1'' by Jewelry by Ioka at SCRHI. Hurry! Limited time offer. Offer valid only while supplies last. CUSTOM ENGRAVED with your choice of letters in SCRIPT or BLOCK font! These items cannot be returned or refunded because of their customization. CUSTOM ENGRAVED - 14K White Solid Gold Stampato Baby ID Bracelet - 6"
CUSTOM ENGRAVED - 14K Yellow Solid Gold Figaro WP Chain Baby ID Bracelet - 6"
CUSTOM ENGRAVED - 14K Tri Tone Color Figaro 3+1 Baby ID Bracelet - 6"
CUSTOM ENGRAVED - 14K Tri Tone Color Heart Link Heart Baby ID Bracelet - 6"